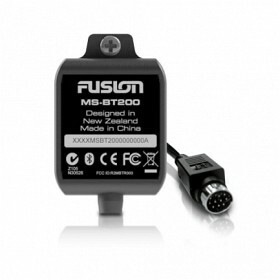 Introducing the FUSION MS-BT200 marine grade Bluetooth audio module. Certified IP65 water resistant and tested for the open road, the MS-BT200 is designed to connect to the FUSION MS-IP700, MS-IP700i, MS-AV700, MS-AV700i and MS-RA205 only via the Satellite radio connector of the unit. The MS-BT200 module streams audio from any A2DP Bluetooth capable Apple, Android, Windows, Blackberry or other device directly to the compatible FUSION marine stereo. Direct Media Device Control - allowing you to quickly and easily select tracks, album, artist or playlist from your device while you're on the go around your vessel. What separates the MS-BT200 apart from other Bluetooth modules is the integrated voltage protection, which is engineered specifically to manage fluctuating current or voltage spikes. This added protection ensures no disruption to your listening pleasure. With an effective range** of 10 Mtrs (33ft), you can enjoy seamless streaming of your favourite audio tracks without having to return to the stereo to change tracks. Please note if the Satellite connector of your FUSION lifestyle stereo is already in use, please purchase the MS-BT100 for Bluetooth audio streaming. **Effective range measured in a straight line, range will differ depending on placement of the Bluetooth module and obstructions.